Beverly Hills, CA – “And the Oscar goes to… Glenn Close for The Wife.” That is what Sony Classics hopes will be announced at the next Oscars ceremony, (February 12, 2019), when the Best Actress statue is handed out. For the most part, Oscar contender movies are released in the fall, when voting is fresh on the minds of voters, not in late summer when people are on holiday or getting ready to send their kids back to school. For the movie The Wife and for Glenda Veronica Close, however, the studio did what they needed to do, what they had to do, to accommodate Close’s rehearsals for her upcoming Off Broadway, Public Theater lead role in Mother of the Maid, (which premieres September 25, 2018), in which she stars as Isabelle Arc—Joan of Arc’s mother. Ironically, the play is written by Jane Anderson, the same woman who adapted Meg Wolitzer’s novel, The Wife, for the big screen. While The Wife hits NYC and Los Angeles movie theaters August 17, 2018 (and rolls out nationwide, slowly through the end of summer), the junket for the film was July 24 and Close has been promoting it endlessly for the past three weeks. 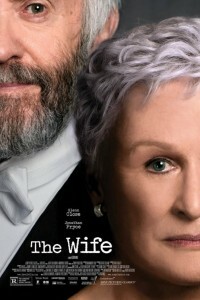 Directed by Bjorn Runge, The Wife is a movie that will keep you guessing until the very end. After nearly forty years of marriage, Joan (Close) and Joe Castleman (Johathan Pryce) compliment each other: Where Joe is brash, Joan is shy. Where Joe is slovenly, Joan is elegant. Where Joe enjoys a very public life as Great American Novelist, Joan pours her considerable intellect, grace and charm into the private role of Joe’s life, keeping the home running smoothly, the adult kids in close contact and Joe’s pills dispensed on schedule. I needlessly remind Close, who turned 70 this year, that her career took a 180 degree turn from the one of Joan’s. To date, she has been nominated for six acting Oscars, currently the most nominated non-winning actor alive. Deborah Kerr and Thelma Ritter were also nominated for six acting Oscars, neither even winning. First nominated for the Best Supporting Actress Oscar for her role in the 1982 movie The World According To Garp, Close was nominated for four additional Oscars in the 1980s; Best Supporting Actress for 1983’s The Big Chill, Best Supporting Actress for 1984’s The Natural, Best Actress for her most acclaimed role to date, 1987’s Fatal Attraction (where she lost to Cher, who won for Moonstruck), and for 1988’s Dangerous Liasons. Ironically, Fatal Attraction is as relevant today as it was in 1987. “Yes,” agrees Close, when I point out that the movie could have been made today, and other than cell phones replacing land line phones, nothing much else would have changed. Twenty four years went by without another Oscar nod, but in 2012 she received one for playing a woman pretending to be a man in the movie Alfred Nobbs. However, most millennials and those who make up the Generation Z crowd know her best not from any or all of her Oscar nominated roles, rather from playing Cruella DeVil in the live action 101 and 102 Dalmatian movies from Walt Disney Pictures. The most interesting thing about The Wife is that in the flashbacks, Close’s real life daughter, Annie Starke, plays Joan. Glenn Close is a three time Tony Award winner: twice as Best Actress (Play), in 1984 for Tom Stoppard’s “The Real Thing” and in 2002 for “Death and the Maiden”, and once as Best Actress (Musical), for “Sunset Boulevard”, playing Norma Desmond. She has also won Emmy and Golden Globe awards. Close didn’t make her big screen debut until 1982, when she was 35. Before that it was all theater. If her latest theatrical endeavor was not an Off-Broadway production, chances are we could have seen Close winning not only an Oscar next year, but also another Tony.